I have chest pains. I’m serious. I am five minutes away from calling an ambulance. The only thing stopping me is that my friend Milt recently called an ambulance because he felt chest pains, and it turned out he was having a panic attack, which is not life-threatening but just as expensive. The ambulance charges the same for panic attacks as it does for pulling you back from the precipice of death—roughly the rate of a pair of healthy human kidneys on Chinese eBay. I hear I should call the fire department instead, because they provide EMS, and it’s cheaper than ambulances. I’m probably having a run-of-the-mill heart attack anyway, not a stroke or a pulmonary embolism or anything special—no paddles necessary. Very standard. I remember during my long and not illustrious career as a flight attendant I once made it all the way to the layover hotel in Frankfurt before finding out someone had died of a heart attack in the front section of the plane. I was in the back, buffered from the dead man by about 300 passengers, so all I noticed was that disembarkation took much longer than normal. Probably because the flight coordinator had to fill out the incident report before the medical crew could cart off the body. When I try to remember what the man looked like, I either come up empty or fill in the blank with a pleasant face. When someone dies within the confines of your space, even if that space is a commercial jet half the size of a football field, the occasion should merit thought. “The heart is a hollow muscular organ,” my father once told me as he brandished a canister of tiny nitroglycerin tabs from his doctor, who’d informed him he’d probably had a couple of heart attacks already and hadn’t realized it. My dad laughed it off, though nitroglycerin seemed serious enough. Builders used it to blast through mountains in the 1800s in order to lay railroad so people could move to Northern California and create mansions like the Winchester Mystery House, a colossal curiosity of architecture that is now a tourist attraction. My father liked oddities, and the Winchester Mystery House was one of his favorites. It started out as a simple farmhouse and ended up a giant amalgam of elaborate staircases and passageways, some broken, some abandoned, and some built upon. It was a perpetual work in progress augmented by other works in progress—never finished, yet no space left blank. My dad said it was commissioned by a woman mad with grief over the death of her family. Her heart was hollow, and she wanted to fill it. A few years later, my dad himself died. It was sudden. He was the age I am now. This probably explains my own chest pains. Maybe they are not serious, but then seriousness is relative. I recently had to break it to my daughter that Ria Pell, Atlanta celebrity chef and the benevolent owner of Ria’s Bluebird, a breakfast joint around the corner from us, had died suddenly. Mae has known Ria her whole life, and two of the servers at Ria’s restaurant are parents to Mae’s schoolmates. I remember taking Mae to Ria’s Bluebird on her fourth birthday. She ordered the brisket. It seemed like a lot for a four-year-old, and it was. Ria used to keep a picture of Mae and some of the other neighborhood kids taped to the coffee machine. 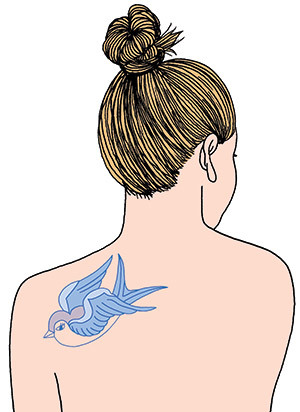 The Lady Liberty Tattoo parlor was offering commemorative bluebird tattoos in honor of the beloved chef—who herself sported an artful body landscape—with proceeds going toward her funeral services. Ria was young. Younger than my dad when he died. Younger than I am now. “Can I get a tattoo?” Mae asked. My heart. It hurts. People are brought into this world a clean slate; then their slates become lively and expressive and colorful and anything but blank. Their slates interconnect with those they love to tell a bigger story, and the story is never finished, is it? It continues, a perpetual work in progress augmented by other works in progress. People die young. It happens. Still, these pains in my heart, these are just probably pieces of my slate, some broken, some abandoned, and some built upon. What’s missing, though, are the blanks. Those have all been filled. This article originally appeared in our February 2014 issue.